Han Solo may be the coolest guy in the galaxy but there’s one thing he won’t be able to get his roguish mitts on: merch from his own Han Solo movie. From blasters to, yes, Funko Pops, there’s enough here to make you not care who shopped first, just as long as you get to cradle a mini-Chewbacca in your arms. No, just me? The ten-strong lineup of Pop! figures from the Han Solo movie will make any completionist collector feel their wallet get a little lighter just by looking at it. Featuring Han, Chewie, Emilia Clarke’s Qi’ra, Lando and Paul Bettany’s villainous Dryden Voss among others, these Pop! figures will be available from the majority of retailers. For those who are aching for more realistic-looking figures should look no further than Hasbro’s 6-inch Black Series line. Han Solo, a snazzy new Range Trooper and Lando Calrissian are the headline acts from the first wave of releases. 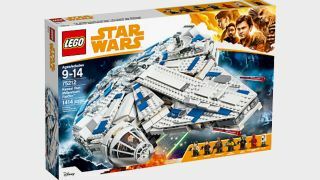 The big daddy of the Han Solo movie Lego offerings is undoubtedly this behemoth of a brick-by-brick recreation of (possible spoilers here), the movie’s Kessel Run. Han’s legendary exploits started right here – and it needed a legendary Lego set to match. Coming with six minifigures, three weapons and even electrobinoculars, this is as close as you’ll get to joining Han and the gang speeding through in under twelve parsecs. Han Solo isn’t all quips and high-speed chases you know. Chris Miller, Phil Lord and, latterly, Ron Howard have all helped craft a beautiful backdrop for the galaxy’s greatest smuggler to ruffle a few feathers in. There’s no better way to take it all in than this official art book, featuring concept art, storyboards and paintings. Han loves to play the odds, and now you can too! Inspired by an actual game in the movie, this Han Solo Card Game set comes with 62 cards and 2 (hopefully not loaded) dice as you aim to collect the greatest bounties in the galaxy. Let’s not discount Emilia Clarke’s Qi’ra. If this Nerf blaster is anything to go by, she’ll pack a mean punch herself. Coming with four glow-in-the-dark darts, you can annoy siblings and co-workers alike by firing this blaster from up to 75 feet away. Don’t forget to make the ‘pew pew’ sound! If you want to go all-out and add to your figure collection, these Han Solo Movie 12-inch figures from Hasbro pack in all the detail you’d expect, including Han’s smug look, Qi’ra’s stylish ‘don’t mess with me’ ensemble and even, if you need a baddie, the no-nonsense attitude Imperial Patrol Trooper. And all at a (very) reasonable price.